One year ago, I lost all my memories. Who I was, where I was from, all of it was gone. I tried to live past it, looking only to the future, but the darkness that was my past still haunted me. 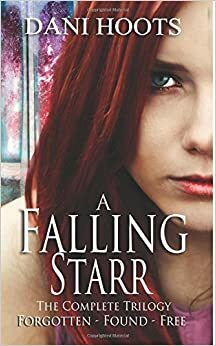 Angela Starr had no memory of who she was after that accident one year ago and it wasn’t until a man from clear across the galaxy came, saved her life, and took her to this strange new world did she feel that she finally belonged. But the question still remained, who was she? Why did he risk her life for her? And more importantly, why were people trying to kill her? With no one wanting to answer her questions, Angel Starr must face the truth and force herself to get her memories back, or all could be lost. The paper is a collection of all three novellas of A Falling Starr Trilogy: Forgotten, Found, Free. Available on Etsy, Amazon, and Barnes&Noble. One year ago Angela Starr woke up in Portland with no memory of who she was nor where she was from. Since then she has been searching for any trace of herself, only to find nothing. Wanting to move on with her life, she decides to enroll into college only to run into someone she feels familiar with. Did she know him before the accident? Did he have the answers she had been desperately searching for? With strange men following her and a man who seems to know more than he is letting on, Angela Starr may finally find what she has been looking for. Available on Amazon. Angela Starr finds herself in a whole new world with flying cars, strange people, colonies on the moons, yet it all feels familiar. With her memories slowly coming back, will she finally be given the answer as to who she is and where she is from? Or will she find out the truth after it is too late? Available on Amazon. Learning the truth as to who she is, Angela Starr must decide what she is going to next. Will she take up her responsibility and stop Michael once and for all? Or is it too late? Available on Amazon.